In the current age, when everything is just about a touch or swipe or everything you need can be found on a single click, it has become vital that the tools for app development must also keep up with the enduring technological revolution. As technology advances, app developers have more options at hand when it comes how to develop an app. Precisely, the hybrid app development segment seems to have grown rapidly as more companies are seeing the pros of developing a single app that can work seamlessly on Android & iOS devices with a single codebase. Well, in that case, React native has gained quite a reputation for cross-platform mobile development since its commencement by Facebook in 2015. However, Flutter, Google’s response to React Native that was initially launched in 2017 is not far behind. This would also help business owners, startups selecting the best one for their mobile app development project at an ease. One thing also they can do is they can also hire developers from top mobile app development companies to strive their full stack development work. However, the issue with React Native is visible when app developers are developing cross-platform apps, but as far as native apps are concerned, one will not face any performance related glitches. It provides faultless performance in all standard case & is exceedingly reliable. While developing the Hybrid apps using React Native app development, one has to face architecture, libraries and native component related glitches while flutter emerges with the code reusability features. Well, building UI blocks is another vital aspect of this fire-hauling battle. When it comes to formulating blocks for the user interface, there is a big gap between React Native & Flutter. Where React Native is based on native components, Flutter has different scenario-it works exceptionally good with proprietary widget sets. In fact, the case of owner widgets is quite exciting and help you obtain fully customized UI designs with good interoperability with additional native support. Regrettably, there are some loopholes too. If we take Cupertino library, which lacks the iOS style way components and this is big glitch among the mobile app developers. Well, in the battle of React Native VS Flutter, the user experience is much better with React native. On the third round of battle, we are comparing both Google Flutter & React Native on the basis of documentation & tooling. Flutter provides regimented & efficiently mild documentation, which indeed simplifies the job of the app developers. Without having a single doubt, it proves better than React Native in the documentation. Now coming on Tooling, we can see a rigid competition between the two frameworks. Flutter comprises of wide range of IDEs & tools that support React Native. The cluster of mobile app development companies that have materialized these days has verified their superiority in the timely delivery of projects & React Native has remained one of the best helping hand for all these app development companies. The role of frameworks in mobile app development is to reduce the development timeframe and adds more to user interface & charge less time to develop projects. 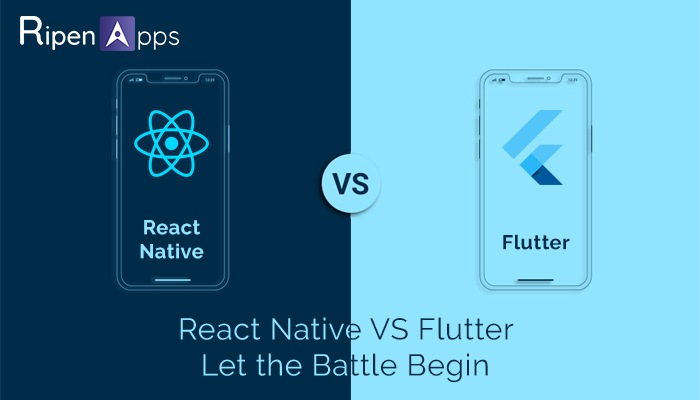 The fourth round of the battle compares Flutter & React Native on the basis of their development time frame. In the comparison of Flutter VS React Native, Flutter is new & requires considerable time to develop projects. React Native has ready to use components that help accelerate the landscape of mobile app development without creating many issues for app developers. Flutter also guarantees high-quality usability, but the framework for app development needs to get more credit over React Native. While developing a hybrid app, stability is the vital factor to look over. And again, we have tough competition here. In this phase of the battle, flutter is lacking behind since it had only its alpha version, which was not very suitable for longer projects. React Native was quite stable from earlier and it enjoys the support of a large community of contributors. Round 6: Who Has Strong Customer-Base? The final round of battle based on clientele. The popularity of React Native does not need to mention for businesses these days. It is still one of the most approachable mobile app development frameworks for app developers for all ages. Some of the most popular clients include Skype, Facebook, Tesla, Airbnb, Instagram, Walmart and many more. Since was launched a few years ago, it does not have much to show its presence from the industry standards. At present, only a Hamilton app is what it has in its bank. However, as time progresses, many more will surely be added into that list as it as a bright future. Well, announcing the winner at the end is rather difficult, because both the warriors React Native & Flutter app development have their own set of pros and cons. But before moving ahead, one must not ignore that Flutter is still new in the era of app development, and React Native has settled their group of clientele. Although Native passes the edge over Flutter after an honest comparison the later has bright future. The final choice has to be made by the developers based on their specific requirements. Still, have any query about both of the frameworks, leave the worries behind the wall and ask us to get assistance. Drop your queries at sales@ripenapps.com.